The inflatable stage prop displays layers of earth and rock, and sits on a tarp that represents the land and ocean. A fabric waterfall demonstrates how water flows from a river out to the ocean. A tunnel on one side includes an airbrushed fossil record, an oil deposit and a fault line. "During our science program, students waft the river as the waterfall weathers and students erode the sediments down the river to the ocean to form a delta. 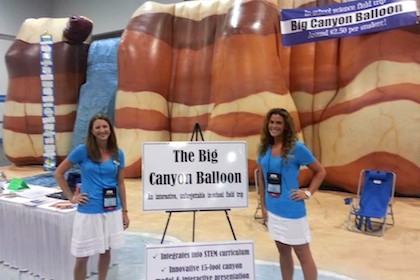 The Big Canyon Balloon model is fantastic for teaching earth science to students in grades K-8th grade," explains Laurie. "The most impressive achievement I have made with the Big Canyon Balloon was when a young boy ran up to me after my class and said, ‘I didn't get this until you taught me with your model!’ Students love learning in this interactive bigger than ‘WOW’ way. Teachers are amazed that I can teach their entire earth science unit in an hour. Data supports that my program raises test scores. My inflatable doesn't help my business. My inflatable IS my business!" After having one bad (and costly) experience with another inflatables company, Laurie needed someone she could depend on. That's when she found Landmark Creations online. "I liked the way Tom listened and shared his ideas with me so that I could use the canyon like I needed. Tom hit a home run with my model. His input made all the difference in the world. I am currently planning a new model and can't wait for Tom to create it!" We're just as excited as Laurie is about helping students succeed. Looking for more impactful educational inflatables? Browse our online galleries!